The show that launched a million animated GIFs and spread conflicting messages of acceptance and ostracisation is still doing its thing, eight years after its 2010 premiere. 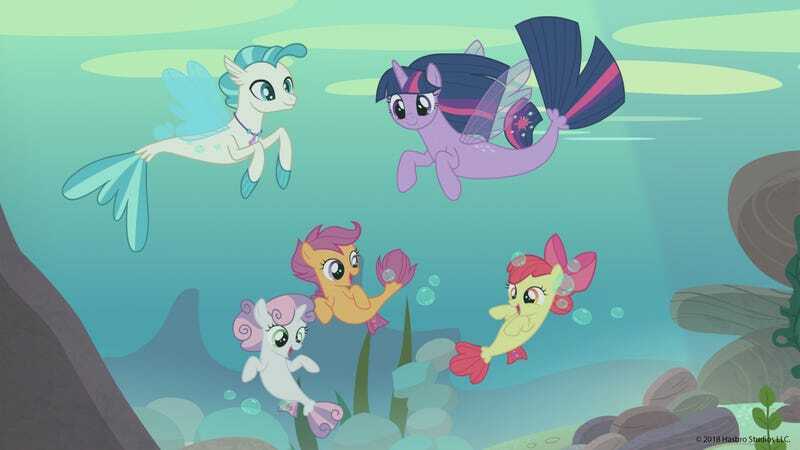 The new season brings new locations, new magical creatures and, according to the official announcement, seven original songs that are sure to have fans and fathers of fans singing along. The new season launches with a two-parter called "School Daze." 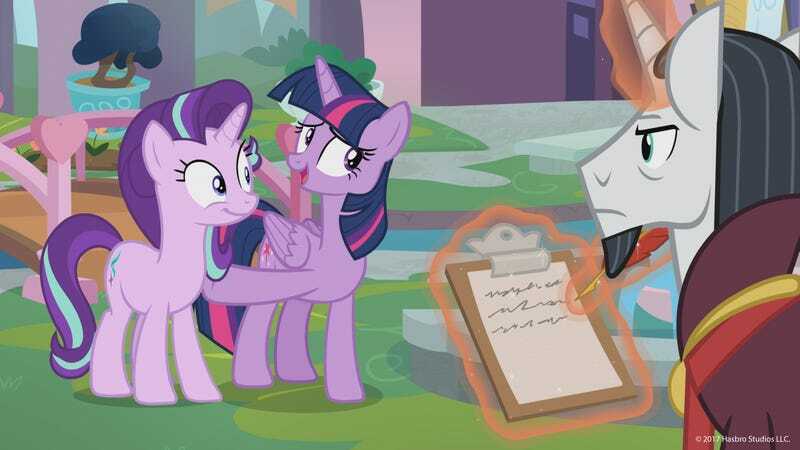 Following the events of last year's My Little Pony: The Movie, Princess Twilight discovers that the Friendship Map has expanded to include lands outside of Equestria. Lands ripe for indoctrination. 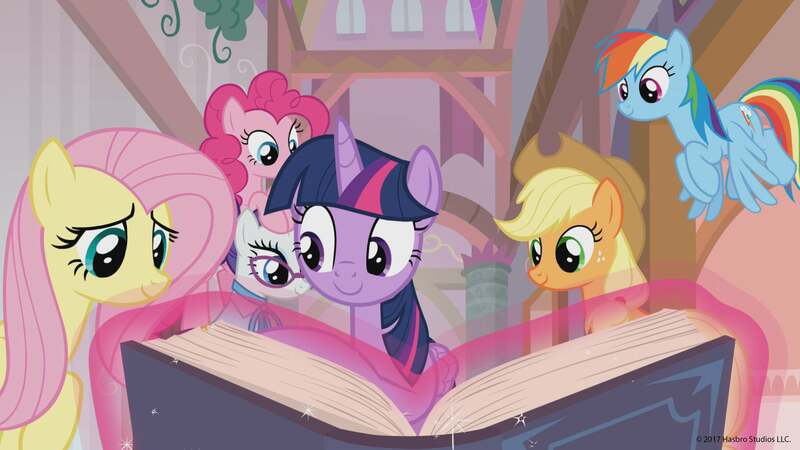 Eager to spread her friendship-based ideology, she founds Twilight Sparkle's School of Friendship. 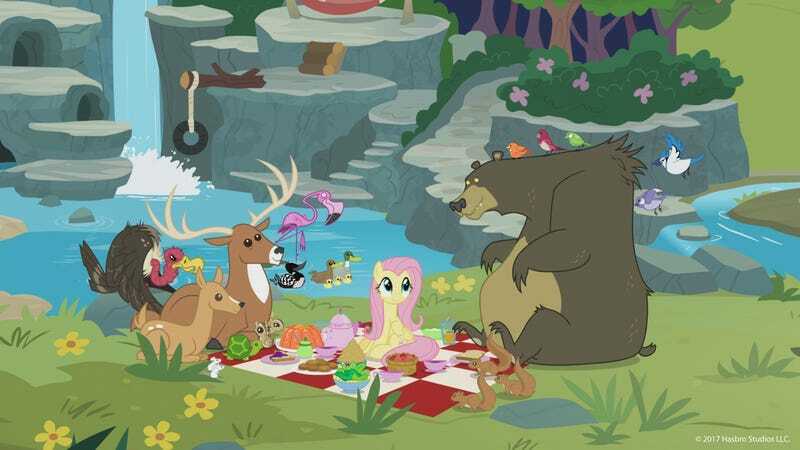 It's a magical place, of course, where ponies and non-ponies alike can gather together and learn that being nice to one another is better than getting mad at me for posting about My Little Pony. 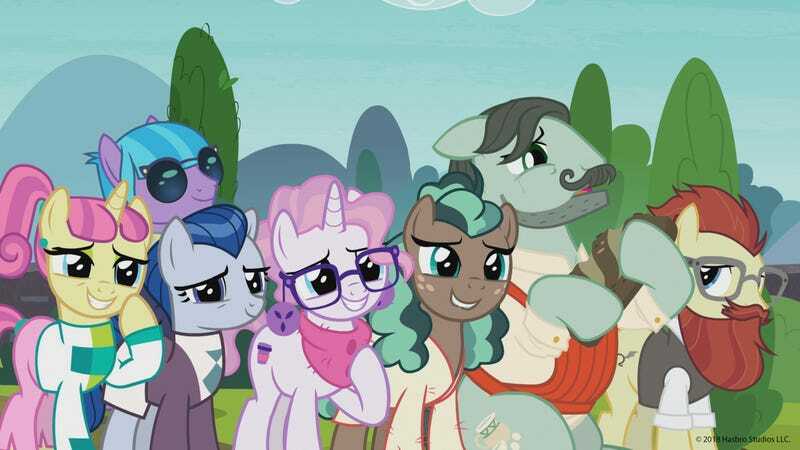 While the Mane 6 (Twilight, Rainbow Dash, Fluttershy, Rarity, Apple Jack and Insane Pink Horse) remain a focus, the new school gives rise to a new group of six mismatched friends. 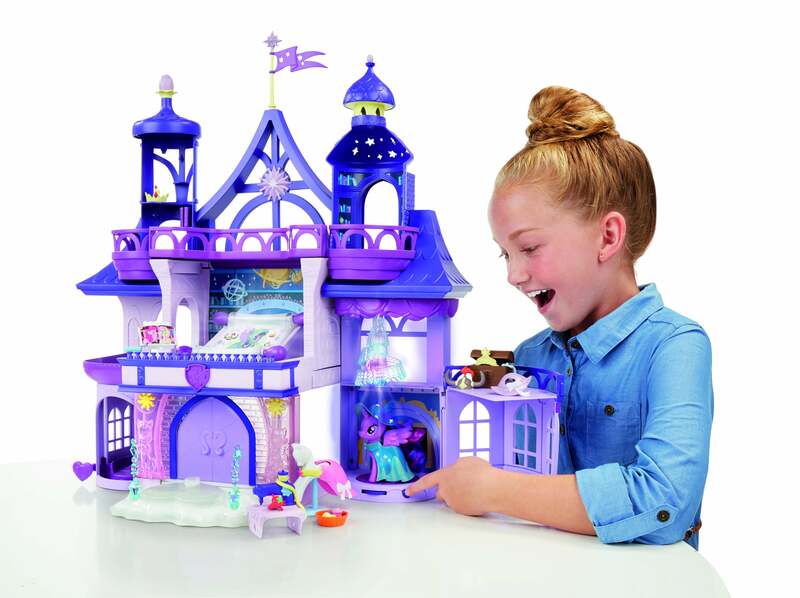 It's a $US60 ($77) Magical School of Friendship, sure to be adored by collectors and surprised-looking girls and boys (boys not shown) everywhere. It looks a lot smaller in person. There's probably a boy outside of the shot who is also very impressed. 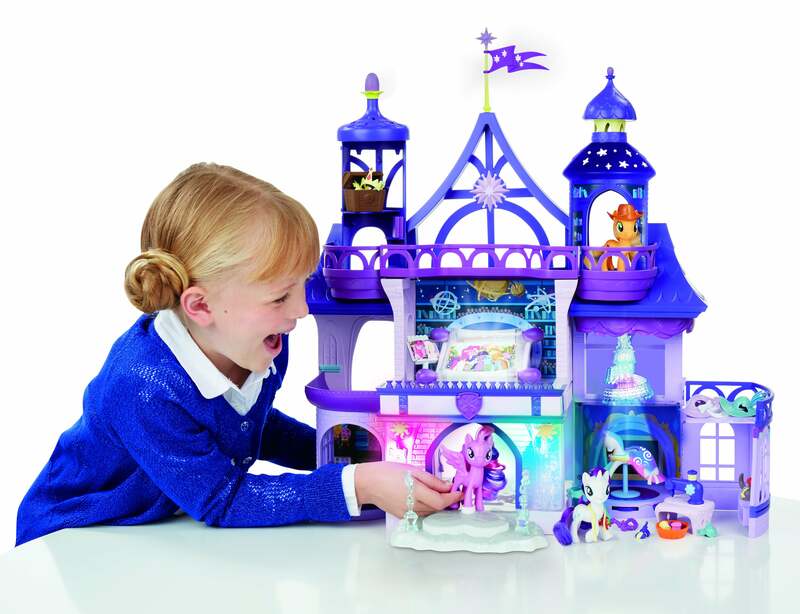 The playset comes with Twilight Sparkle, because her name is on the school. It features a library, a fashion studio - sorry, fashion classroom - and plenty of flashing lights to distract children from the fact that their character toys are just statues. Apparently the articulated figures from 2016 didn't catch on. Pity. 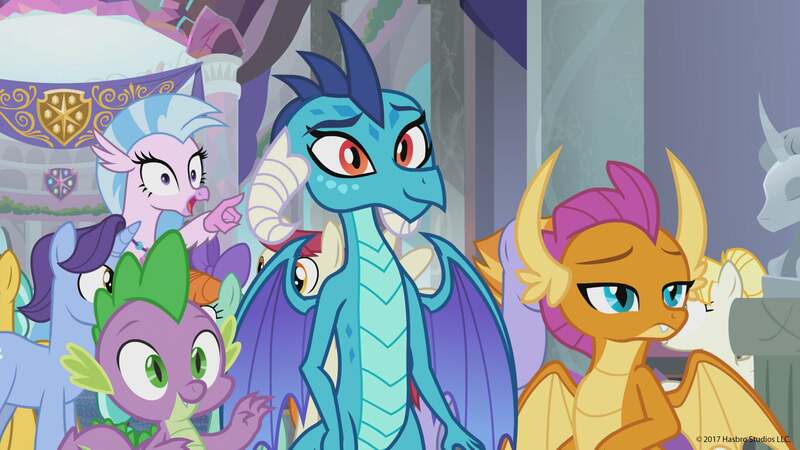 The school is nice, but the biggest news of the new season is that everyone's favourite purple and green baby dragon, Spike, is getting his wings. He's growing up so fast! Before long he'll be terrorising the countryside and setting villages on fire. With friendship. Fire is friendship. 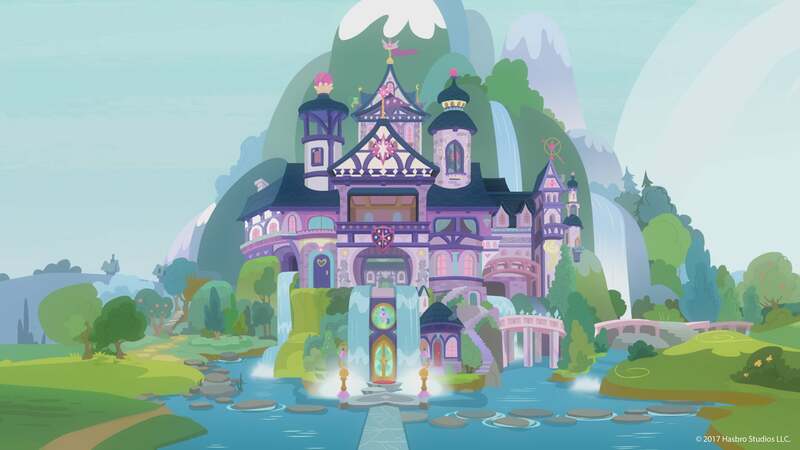 My Little Pony: Friendship is Magic's season eight kicks off on Saturday, March 24 at 11:30 AM Eastern. Check out the slideshow below for some choice stills. Yeah yeah, we’ve seen these ponies. Do I smell marriage? No. 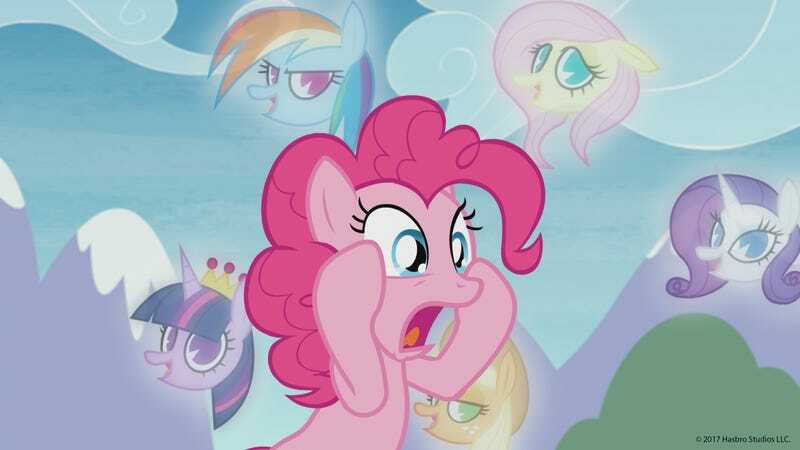 Pinkie Pie should be locked up. 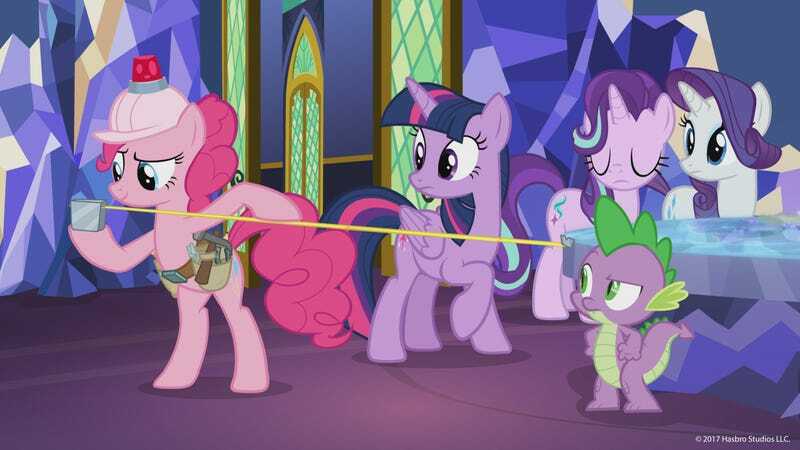 I am guessing that in this still Pinkie Pie accidentally kills all of her friends with one of her complicated party contraptions and they’ve come back to haunt her. 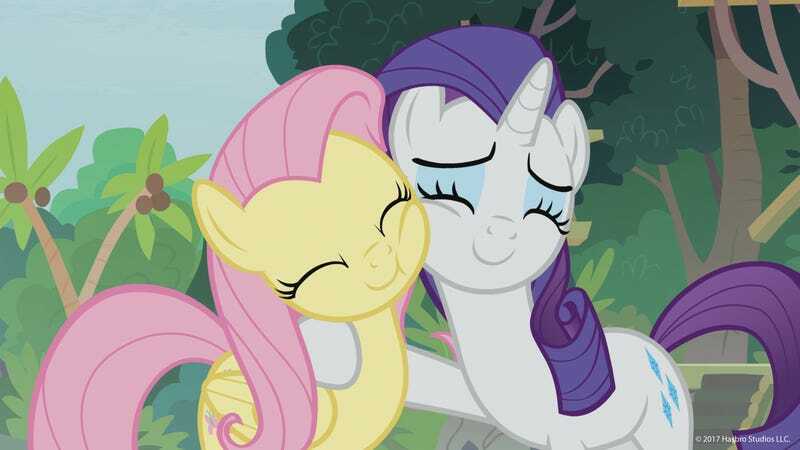 In this episode, Rarity and Fluttershy probably get glued together by the face. 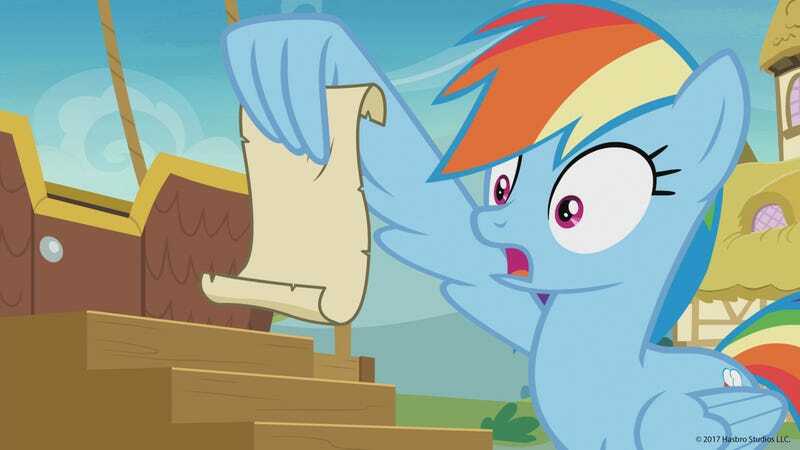 How do ponies that don’t have magic get dressed? 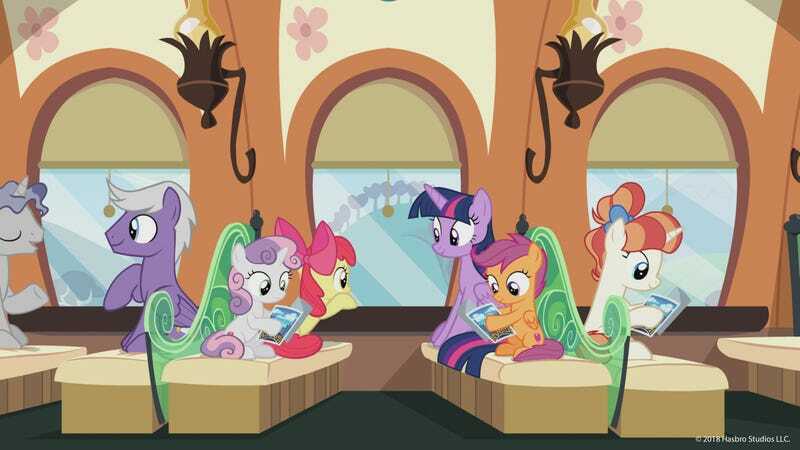 The Cutie Mark Crusaders got their marks back in season five, ruing them forever. It was sort of like when David and Maddie got together in Moonlighting. This is not helping my wife’s swim fin addiction. 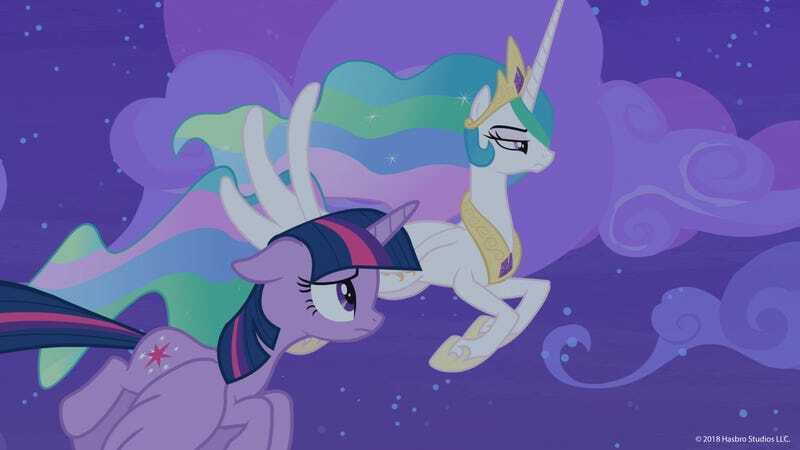 Princess Celestia makes Twilight Sparkle feel bad about not having long, flowing hair. Mainly here to point out that ponies with beards freak me out.